I’d never done a trunk show before. You know me–that was all the excuse I needed to over-think and over-prepare! But I think it was a successful event. You can see the photos of my set-up here. 1) A trunk show means you bring EVERYTHING. But it can’t look like everything-plus-the-kitchen-sink, either. I still wanted a cohesive display. So I set out several “series” of jewelry and grouped them accordingly. I had plenty more samples in reserve. 2) It should look different than a craft show booth. My artist-of-the-month display looks a lot like my fine craft booth. It’s a formal display, an in-depth look at my work in a museum-like setting. But I wanted my trunk show to look like just that–like I’d traveled to the show, bringing a personal collection of items for my customers’ enjoyment. I even asked for a few chairs, so that people could sit and talk as I worked. 3) It should still be obvious what you’re selling. 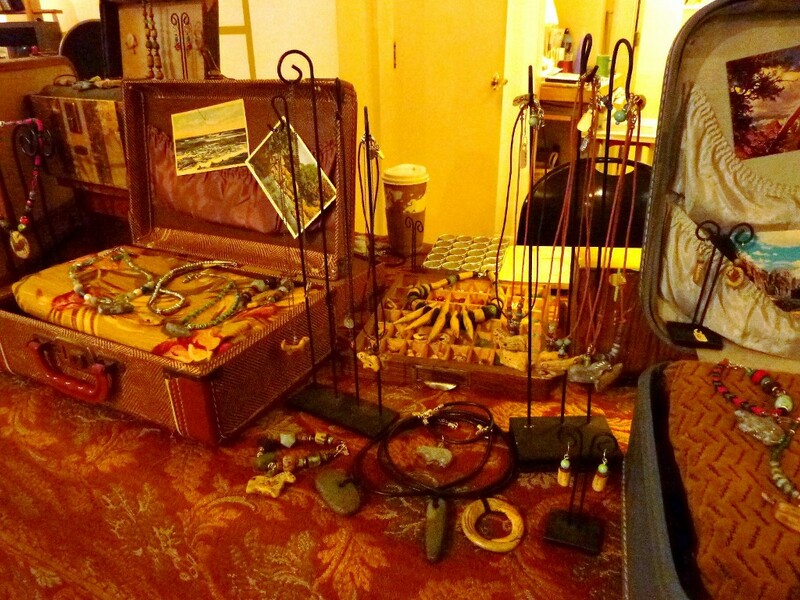 I got around this by sticking to the vintage suitcases as my only “prop”. The rest of the display featured traditional black steel jewelry display pieces–earring holders, necklace holders, etc. I also confined my larger, bolder, more elaborate pieces to the suitcase display. The smaller, simpler pieces went on the traditional display fixtures, where they were able to be seen more easily. 4) Give people a reason to hang out. At a craft show, there may be thousands of people coming with the intent to see as much as they can. If they like my work and my booth, they enter. Then they are in “my world”. It can be harder when you’re simply a display in a store. Right next to your table are examples of a dozen other artists’ work! I decided to do make up some simple necklaces featuring my artifacts and torch work with sterling silver wire. This gave even casual observers an excuse to hang out, watch and ask questions. 5) It’s only your time. Have fun! Yes, my time is valuable, but it wasn’t like I was paying hundreds or even thousands of dollars to be there at the gallery that day. It was a nice, relaxed opportunity to introduce new people to my work. So by keeping my expectations low, my presentation skills high, by keeping myself busy even during slow times (but totally available during busy times) I ended up having a great time, acceptable sales and met some amazing new collectors of my work! Trunk display for my trunk show!